The journey Tyler Donoho has taken from adopted son to older brother and now to having an active warrant for his arrest is a long one. STOW, Ohio — The journey Tyler Donoho has taken from adopted son to older brother and now to having an active warrant for his arrest is a long one. "It just came to a point where we realized traditional medicine wasn't working," said Tyler. Court records show Tyler's doctors have diagnosed him with nine different disorders, including Anxiety, Autism, and Post Traumatic Stress Disorder. He's already been on a long list of medications, so his most recent doctor gave Tyler a recommendation for medical marijuana and a prescription for FDA-approved Marinol with compounds found in medical marijuana. Tyler's dad says after completing behavioral treatment, Tyler is able to maintain a house and care for a dog, responsibilities that likely wouldn't have been possible before. "It made sense to us after trying 10 to 12 odd years of trying different psychiatric meds," said Tyler. Both Tyler and his dad, Bill, say the Marinol makes it possible for Tyler to function. "When I'm not [on Marinol], I get caught up on the same thought," said Tyler. "Reoccurring over and over and I have trouble focusing on more than one issue." Court documents say those flashbacks are from instances of life-threatening violence that Tyler experiences again. Court records show Tyler has been struggling with a long list of disorders that doctors have tried to treat with many different medications. But the treatment caused a positive result in a court-mandated drug test as part of Tyler's probation for a misdemeanor charge in 2017, that Tyler says is related to his diagnosis. Tyler does have an Affirmative Defense Letter from his doctor, explaining to the justice system that Tyler has been recommended to use medical marijuana at treatment. But Franz Ward LLP Attorney Tom Haren says those letters are only good for criminal possession charges. "The Affirmative Defense is silent on how that interacts with someone who is on probation for an unrelated criminal offense," said Haren. Haren says this exposes a part of Ohio's Medical Marijuana Control Program roll out that legislators might not have realized would be a problem down the road. He says it's up to the legislature to clarify how they want the courts to handle people on probation who use medical marijuana, just like they specified similar rights for employers. "They can refuse to hire, they can suspend, discipline, and fire people who use medical marijuana in violation of a drug-free workplace policy," said Haren. But he says responsibility also falls on the legal system and law enforcement to learn about the law, while also falling on patients to consult with a lawyer if they are on any form of medical marijuana while also on probation. He says since the law is so new, it's already caused confusion when someone with an Affirmative Defense letter is involved in a traffic stop. "Then, once it gets into the court system, the confusion doesn't end, it just gets more confusing," said Haren. "This is unconscionable for me that someone wants to prevent someone from getting the best medical treatment there is for them," said Tyler. 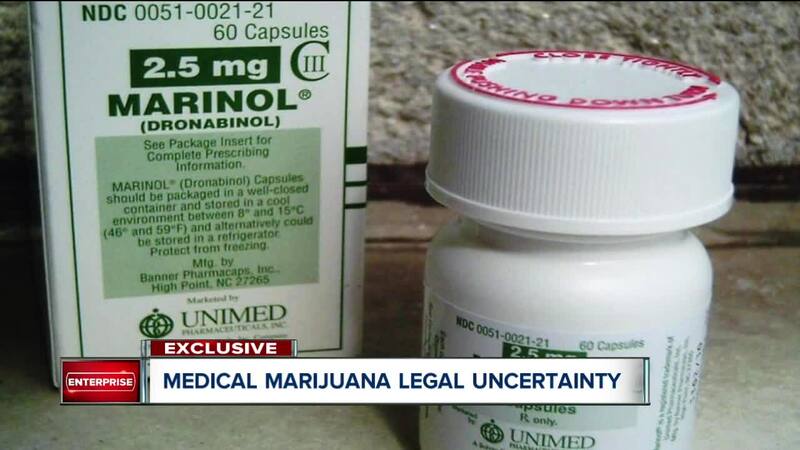 Since medical marijuana is expected to be available in Ohio within weeks, chances are high that it will intersect with the justice system much more frequently. "Litigants, criminal defendants are going to be using medical marijuana and courts should be families with how the program works, how it operates, what's prohibited, what's permitted," said Haren. Tyler's defense for the positive drug test is along the same lines. "They're the ones that told me I have to go seek medical treatment and this was the treatment that was given to me," said Tyler. In the meantime, just before Christmas, a bench warrant was issued for Tyler's arrest because of the failed drug test. An appeals court has already rejected Tyler's appeal saying the Chardon Municipal Court made an error by not adjusting the terms of his probation, which might have avoided his probation violation. "I think the legislative intent is incredibly clear: to provide relief to patients like Tyler," said Tyler's dad, Bill. Bill says potentially going to jail would be a disaster for Tyler because of his various disorders. "The trigger-rich environment, with no support, of jail, I fear for him," said Bill. Tyler completed a behavioral health program in Utah which Bill says has been extremely effective at helping Tyler to control his emotions, with the help of medication. But if Tyler is locked up for violating his probation, "I fear that the progress that he's made in the last 18 months...could be erased in a matter of minutes," said Bill.